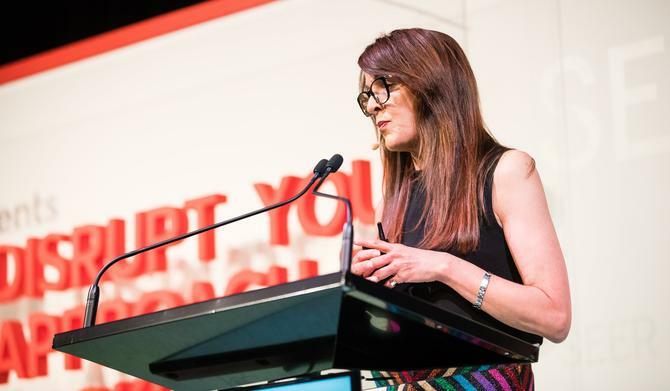 Having a great boss that challenges and supports you, being brave enough to see risky ideas through, capitalising on customer insights and failing are just some of the lessons CMO of Three UK, Shadi Halliwell, has learnt over the course of her marketing career. Taking the opening slot at today’s AANA Reset conference in Sydney, the experienced marketing leader, who has worked across O2, Harvey Nicols and also runs her own pet treats business, shared some of wins and failures she’s had over the course of her career and what it really takes to be a modern marketing success. As a starting point, Halliwell warned attendees against the dangers of putting communications over a clear customer value proposition. Halliwell then outlined six lessons over the course of her presentation. The first is the importance of having a great boss. Halliwell pointed to her former boss at O2 as a case in point, who hated but allowed the marketing team to go to market with its advertising campaign, ‘Be more dog’, featuring a cat striving to be more like a dog. The ad became one of the most successful campaigns the UK, running for three years and prompting consumers to send thousands of letters to the brand about how they were ‘being more dog’. “In this case, it’s about who challenges you but implicitly trusts you as a marketer to put the right messages in the market and really embrace what customers are feeling so your brand can become more valuable,” Halliwell said. The second lesson was “being brave”. As an example, Halliwell pointed to her work at the O2 to start selling priority tickets to concerts at its branded UK venue, The O2. The idea was to create an asset that benefitted its customers while also reducing the stiff marketing costs artists face when promoting their shows. The first task was selling 2000 tickets pre-sale to the Rolling Stones, who hadn’t been on tour for many years. The telco promoted tickets to 5 million customers, sold the lot, and kicked off a new business situation that drove customer engagement and bottom-line growth. It also saw O2 becomes the second largest ticket seller after Ticketmaster. Every good marketer should also “be scared, but also prepared”. Halliwell’s example was approaching Apple to try and win O2 exclusive rights to launch the first iPhone device in the UK. After securing the deal, Halliwell fought to ensure half of all shared marketing collateral was on O2 branding, a stance that saw her making her case directly to Steve Jobs himself. She called it one of the most daunting moments in her career, but also one that proved a huge success. “You have to just go for it, you’ve got nothing to lose,” she said. Another lesson for Halliwell has been that “money doesn’t buy great work”. Marketers should be able to prove themselves great marketers on no money, she said. As an example, she noted a digital campaign for Harvey Nicols’ loyalty program that tapped CCTV footage of people stealing in its stores in order to make a point about getting things legitimately for free. The ad campaign, called ‘Love freebies? Get them legally’, won a Cannes Grand Prix and went viral. Equally, everything you do must be rooted in insight, Halliwell said. This was what drove Harvey Nicols to use 100-year old model and fashion lover, Bo, as part of a Vogue advertising campaign. “What we did is broke the story about people loving fashion,” she said. “That’s the insight: When you do things are insightful and are what customers want to see, it carries through. As a final note, Halliwell said all work and no play “makes you a really dull person”, and noted her recent decision to take up skiing and becoming a jockey as a way of balancing work and play.